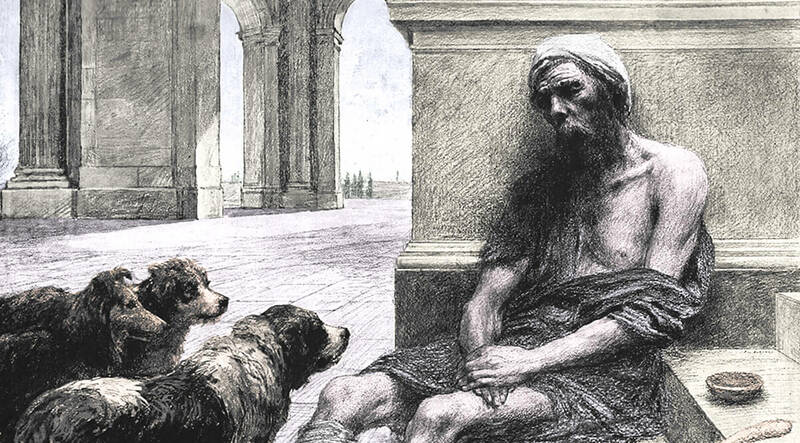 And there was a certain beggar named Lazarus, who was laid at his gate, full of sores, And desiring to be fed with the crumbs which fell from the rich man’s table: moreover the dogs came and licked his sores. And it came to pass, that the beggar died, and was carried by the angels into Abraham’s bosom: the rich man also died, and was buried; And in hades he lifted up his eyes, being in torment, and seeing Abraham far off, and Lazarus in his bosom. And he cried and said, Father Abraham, have mercy on me, and send Lazarus, that he may dip the tip of his finger in water, and cool my tongue; for I am tormented in this flame. But Abraham said, Son, remember that you in your lifetime received your good things, and likewise Lazarus evil things: but now he is comforted, and you are tormented. And besides all this, between us and you there is a great gulf fixed: so that they who would pass from here to you cannot; neither can they pass to us, that would come from there. Then he said, I pray you therefore, father, that you would send him to my father’s house: For I have five brothers; that he may testify unto them, lest they also come into this place of torment.